A few weeks ago, I got a look at a curious kind of mobile marketing head-fake: A new company called "Axon" no one had ever heard of promised the moon and stars in the form of a shiny, seemingly impressive $450 smartphone. 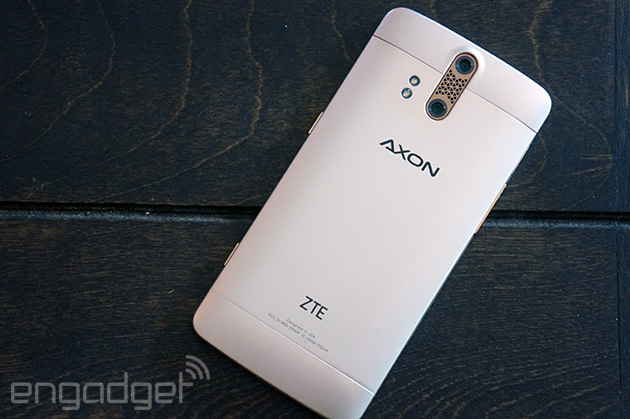 As it turned out, Axon wasn't an upstart smartphone maker taking on stodgy giants -- it was a sub-brand of Chinese OEM ZTE trying to make something cooler than it's normally known for. The ruse worked in that it got a bunch of jaded nerd journalists to an event in the middle of Manhattan in the rain, but is the phone itself actually worth that trouble? 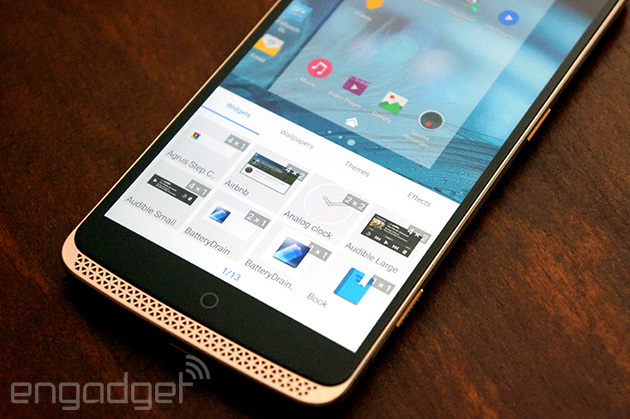 Did ZTE finally figure out how to make a phone that wary US consumers might flock to? The answer might surprise you. ZTE's Axon is a high-end smartphone designed with US consumers in mind, and we apparently crave lots of power, and no expandable memory. The Axon's spec sheet is filled with hits -- the Snapdragon 810 chip is a powerhouse and the audio is surprisingly good -- but some misbehaving software and a fixed 32GB of storage keep it from being a dream phone. Be the first to review the Axon? The model we're working with has a full-on champagne finish, and despite the color, it feels a little less ostentatious than the blingy black-and-gold version I played with a few weeks back. It's a dense, solid-feeling little handset since the body is crafted out of metal but isn't hewn from a single slab. The main section of the Axon's back is one plate, flanked on the top and bottom by metallic caps that form the phone's edges. Turns out they're a potential point of failure, too. I -- ever the klutz -- dropped the Axon from about two and a half feet up onto hard bathroom tile, and while it survived the drop, the corner of one of those edges popped out of place and had to be snapped back into position. I don't think this thing will take a beating; just know that less than a week's worth of jamming it in and out of my trusty blogger bag left the gold Axon with a lengthy vertical scuff I can't rub away. Minor mishaps aside, the Axon's thicker 9.3mm waistline is offset by a gently arching back that settles comfortably into the hand. 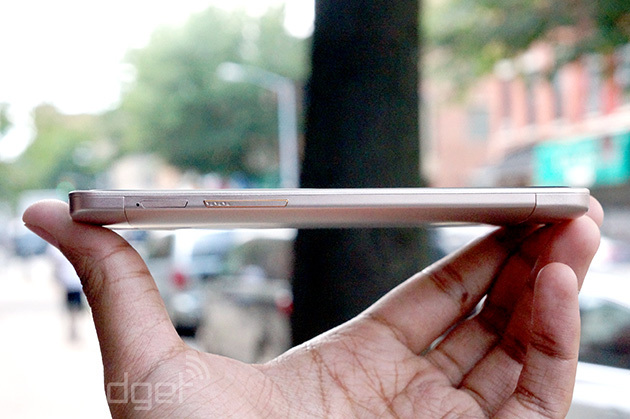 I get the stylistic reasons why other companies (here's looking at you, Sony) don't make contoured phones, but man: curves make a world of difference. As is often the case, that metal construction also means there's no way to remove the 3,000mAh battery, and you'll need a paperclip to pry the nano-SIM card out of the slot on the side. This might take a little more effort than you'd think since the tray has a nasty habit of sticking sometimes when I tried to pull it out. That's really it as far as slots go, too, so you'd better know for sure you can squeeze the entirety -- or at least all the really important bits -- of your stuff into the 32GB of built-in storage, especially since only about 24GB of that space is available to you out of the gate. Speaking of what's inside, the phone is powered by a Qualcomm Snapdragon 810 clocked at up to 2GHz. 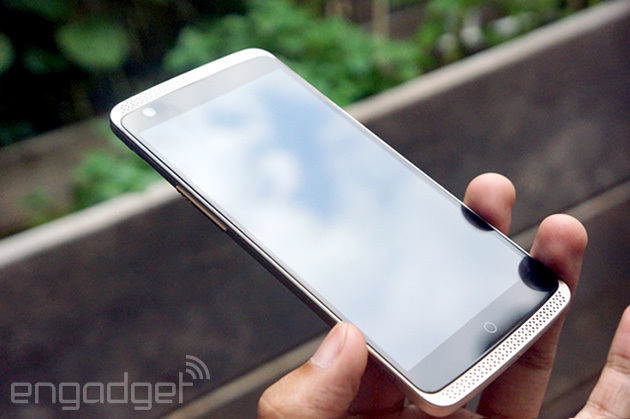 Throw in a whopping 4GB of RAM and you've got a spec sheet that's primed to take on the Axon's pricier rivals. Before you notice any of that stuff, though, your eyes will likely lock onto one of two things: the 5.5-inch Quad HD screen sitting front and center, or all the tiny little triangles festooning the phone. We'll dig into the screen in greater detail shortly, but its spacious dimensions mean the Axon will be a little too big for everyone to comfortably use. Just south of the display lives a trio of capacitive buttons that'll sit just fine with some of you and drive the rest up a wall. I'm not terribly miffed by the lack of on-screen buttons; my only gripe is that the "Back" and "Recent apps" keys are denoted by dots instead of more informative icons. At least you can swap those two options in the Settings menu. Meanwhile, it turns out the grid of triangles above and below the screen are a little misleading. Given the Axon's audio chops, you'd be forgiven for thinking they covered a pair of front-facing stereo speakers, but there's only one, tiny speaker lodged in the phone's bottom grille -- the details are mostly just for show. The triangular motif got plenty of play around the rest of the phone too, as it adds a bit of texture to the shutter button and volume rocker. There's a teensy patch of triangles separating the main 13-megapixel camera from the 2-megapixel secondary shooter above it, but it's basically just a decal under some protective plastic. All told, it's a neat little visual flourish that helps the Axon stand out from the crowd of conservative-looking flagships. The jury's still out on whether our phones really need super high-resolution screens (our eyes certainly can't tell the difference past a certain point), but you won't hear me complain about how tightly packed the Axon's 5.5-inch screen is. ZTE chose an LCD panel that uses what it calls Continuous Grain Silicon (CGS) tech, which, in a nutshell, makes for a thinner high-density display... not that it made much of a difference for the Axon's waistline. Anyway, the whole thing is punchy and saturated, but not quite as overblown as what you'd experience with Samsung's Galaxy S6 or S6 Edge. In fact, it's not too far off from the screen packed into LG's G4 (which strives for more accurate colors than impactful ones). The biggest difference is a slightly warmer, almost redder undertone. I'm the sort of guy who prefers some extra oomph in my screens and the Axon strikes a solid balance here. Brightness and viewing angles were mostly great too, the former being especially important under the pounding summer sun. Thankfully, the auto-brightness setting kept things nice and legible throughout my week of testing. Seeing as we all have our own persnickety screen preferences, I can't guarantee everyone will be as fond of this as I was, but for what it's worth, I haven't spotted any outright dealbreakers. ZTE apparently tapped the wisdom of the crowds to figure out what it had to nail with the Axon, and high-quality sound was near the top of the wishlist. As such, the company squeezed a digital-to-analog converter that lends the phone the ability to play 32-bit audio; rival smartphones like the Galaxy S6 only support up to 24-bit files. That might sound pretty impressive, but c'mon: Is your music collection filled with 32-bit audio files? Yeah, didn't think so. Factor in where people tend to listen to music on their phones -- traipsing down streets, on subways and so on -- and it feels this 32-bit audio push is more an academic achievement than a practical one. However! There's a bit of preloaded software that will actually change up how your audio sounds. The Dolby Audio is installed and on by default, which computationally tweaks your tunes in the hope they'll sound deeper and more powerful than they normally would. After throwing my usual slew of test tracks at the Axon, my natural urge to disable anything that wasn't stock Android quickly evaporated. The meandering synth intro of Capital Cities' "Kangaroo Court" sounded brighter and more expansive on the Axon and the included pair of JBL earbuds than it did on the G4 and the iPhone 6. As the album wore on, "Farrah Fawcett Hair" took on a more spacious feel and highlighted little bits of aural texture I never noticed before. The thing is, Dolby's solution won't be perfect for everyone from the get-go. The default equalizer settings try to punch up the mids a little too much, leaving those highs and lows a little wimpier than I'd like. It still makes songs meatier and more satisfying than they would be otherwise, though, and if you're really picky, you can jump into the Dolby settings and tweak things exactly the way you'd like. What's really depressing is the lack of stereo speakers à la the One M9 -- it seems like an odd decision considering how important good audio is to the Axon, but we've got the laws of gadget economics to blame for that omission. At least that lone speaker is plenty loud. 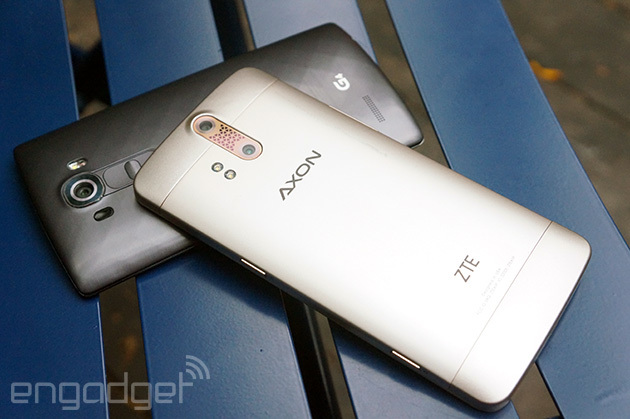 The Axon comes loaded with Android 5.1.1, and thankfully ZTE didn't feel the need to paint over it too much. Aside from some different icons and a custom time/weather widget that greets you upon first boot, you might even mistake this for a stock Android phone. Not quite. First, the interface has some other personalities if the stock-ish default isn't your thing. Long-pressing the screen brings up two alternate themes to load up, called Fancy and Sports. I honestly couldn't tell you what's so fancy about the Fancy look; it changes the default wallpaper to some red feather and axes the app launcher entirely; all your software lives on your home screens instead. And Sports? I don't get why this needs to be here. It makes your icon set round and... that's really it. If you're anything like me, you're better off just ignoring these other options. Unlike other flagships -- the S6 twins and the One M9, for example -- there's no theme store here, which is fine with me. Thankfully, all of Android Lollipop's most important features are just where you'd expect to find them, and there are a few comforting flashes of Material Design peppered throughout the mix. Since the ZTE isn't coming to you thanks to an arcane carrier agreement, there's hardly any bloatware. In fact, I almost hesitate to call the apps here "bloatware" since most of it is genuinely useful. There's Dolby Audio, for one, and a bunch of apps dedicated to sports and fitness. Yahoo Sports is the most inexplicable addition, but it's handy if you want to keep tabs on certain pro teams. Beyond that, an app called RockMyRun offers curated playlists for those marathon-training sessions, along with an activity tracker called Argus that's more solid than you might expect. It nags you to create an account to squeeze the most use out of it, but it'll still track and display your day's steps in what ZTE calls the Z-Tray. When the phone is locked, a little arrow icon will appear at the bottom of the screen -- tapping on that brings up music controls and a quick rundown of your activity so far. Most of the time, the Z-Tray is a useful thing to have, but when the notification shade is full, it's all too easy to open that when you mean to swipe to unlock. Oh, and speaking of the notifications on the lock screen, it hides all but the topmost one, so it requires an extra two taps to see what's been going on. Sort of defeats the purpose, no? 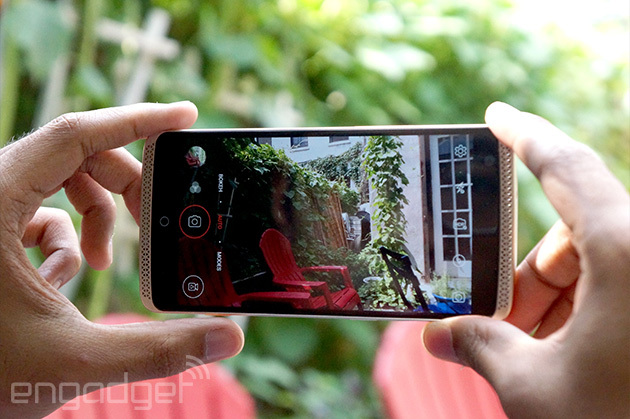 I'll be real with you: I wasn't expecting much out of the Axon's rear-facing camera duo. The novelty of using a second sensor for kooky post-production effects on phones like the One M8 never worked for me; it just seemed like a way to distract from the hit-or-miss quality of the primary shooter. My worries were mostly misplaced. The 13-megapixel camera lodged in the Axon's back is a capable performer, and the Camera app doesn't lean on that secondary sensor for very much at all. There's a Bokeh mode available by swiping to the left of the main camera view (spoiler alert: The results are sometimes cool, but often screwy), and that's really it. So, that main camera. You don't need me to remind you that most phone cameras live and die by the light they're used in, so I'm not blowing any minds by saying the Axon's daytime photos were sharp and nicely detailed. Color reproduction could've been better, though; sample shots were often washed out, undersaturated and lacked the punch you'd see in photos taken with the LG G4 or Samsung Galaxy S6 series. HDR mode mitigates the issue a bit, but man, I hate the idea of requiring HDR for nicely saturated photos (the fact that you've got to physically freeze for it to work well stinks too). The same saturation issues plague the Axon in video recordings, even when shooting in 4K; the camera picks up a respectable amount of detail, but colors often seemed a touch blander than in real life. Things naturally take a turn for the worse when it's dark out; shots were flat and smudgy at best. While I'm griping, I wish holding down the shutter button while the phone is locked would automatically fire up the camera. I guess we can't have everything for $450. On the upside, ZTE's Camera app strikes a fine balance between simplicity and feature bloat. Remember that Bokeh mode? It lets you fiddle with depth of field (down to faux-apertures of f/1.0) and play with the focus after you've already taken the photo. Once you're done there, a quick tap brings up a slew of funky picture modes like multi-exposure to spice things up for an eventual upload to Instagram. My favorite bit? There's an exposure-control slider that appears when you tap to focus on a subject, just in case the camera doesn't adapt as fast as you'd like. Throw in a full manual mode that lets you control ISO, white balance and shutter speed and you've got a well-designed system that only provides as much control as you want it to. If you're a straight-up camera buff, there are better phones out there for you, but most people won't mind the Axon's photo chops. Hardly any surprises here: The Axon's Qualcomm silicon usually performed a little better than the 810 seen in HTC's One M9, but still left room for Samsung's custom chipset to pull ahead. The Axon's SunSpider performance and Vellamo scores are the biggest question marks since they lag behind some of the others, but benchmarks only tell part of the story. Indeed, the Axon is more complex than the numbers might let on. When it came to graphical performance, it was right on par with other big-name flagships on the market. Games like Dead Trigger 2, Asphalt 8 and my new favorite, The Talos Principle, ran like a charm, even with graphical settings maxed out. The combination of a Snapdragon 810 and a metal body does mean that the Axon gets noticeably warm when you start pushing it. More concerning than the warmth were some unnerving moments of flakiness I experienced during my week of testing. Opening a folder of apps took slightly longer than it ought to, even if the folder was relatively empty. Swiping through pages of apps was mostly fluid, except for moments of stuttering when I was in a rush to find something. Once, while shutting down all my running apps, the screen went dark for about five seconds and refused to heed my touch for a few seconds even after it came back to life. Bizarre. I eventually had to restart the phone to get everything running normally again. It's these annoying little bits -- in fairness, things that could probably be fixed through software updates -- that ultimately dull some of the Axon's shine. ZTE tried to keep things light with its custom approach to Android, but the experience of using it doesn't always feel as fluid as it should. Of course, pure power doesn't mean much without the juice to make everything go. The Axon's sealed, 3,000mAh battery performed worse than I thought it would in our standard Engadget rundown test. (We loop a 720p video with the screen at 50 percent brightness with the phone connected to WiFi). The official numbers: The Axon lasted for eight hours and 23 minutes before finally dying on me. That might not sound too bad (it's better than the eight hours and 19 minutes I squeezed out of the One M9), but the G4 and its Quad HD screen stuck around for just over 11 hours. 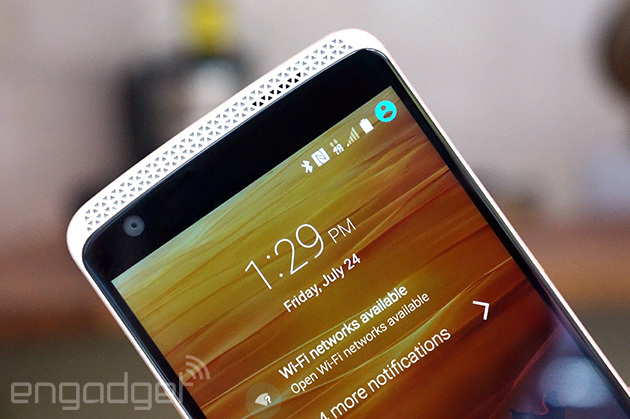 Good thing the Axon packs Qualcomm's quick-charging tech. Thankfully, that battery fared fine with my daily grind, including email and Slack messages, the occasional YouTube video and an odd game or two. All told, it managed 13 hours before needing a top-up. If you're the sort of person who isn't glued to your phone, this thing will hang in there for nearly two days without much trouble. The top of the smartphone heap is already a war zone, and if you're in the market for high-end hardware, be sure to keep these other choices in mind. The HTC One M9 immediately leaps to mind because it too runs a Snapdragon 810 and manages to squeeze a memory card slot into its slim, handsome, all-metal chassis. It also has a nifty after-care angle in the form of Uh-Oh Protection, under which the company promises to swap your busted M9 for a replacement. ZTE's own complimentary Passport program is a little different: It comes with a two-year warranty and a 30-day return policy. The icing on the M9's cake is its impeccable build quality (the BoomSound speakers are a nice get, too), but it'll set you back $649 unlocked -- $200 more than the Axon. Then there's LG's G4, which also features a 5.5-inch Quad HD display, albeit one that's more restrained and color-balanced than the Axon's. Performance can be pretty close between these things, but the G4 has some crucial benefits: a microSD card slot and one of the best cameras in its class. 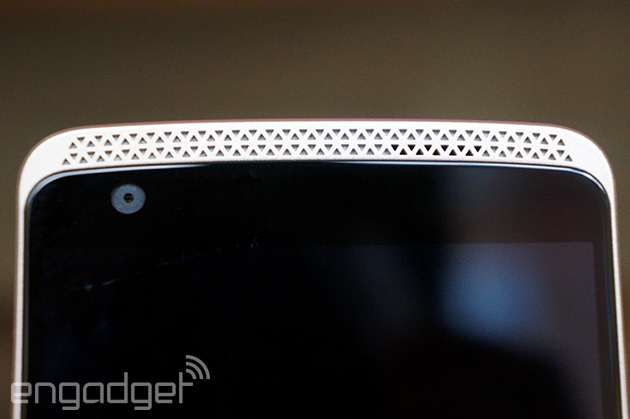 It's available with a beautiful leather finish, too, and it won't weigh down your pockets nearly as much as the Axon. I'd choose the G4 over the Axon if money weren't an option, but it'll still cost extra depending on where you look; eBay recently had a European version of the phone for $499, and prices online still hover around $550 for a new-in-box model. 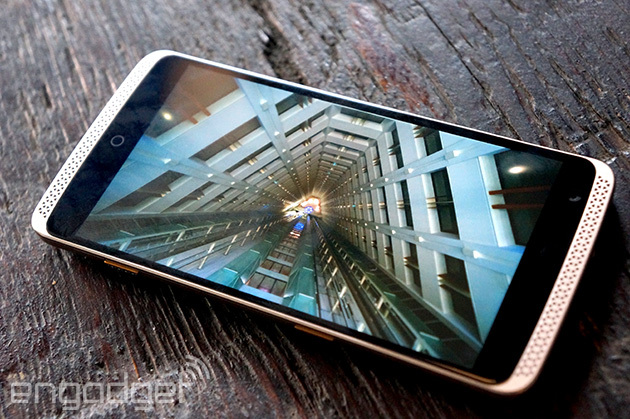 And then we've got that other high-end smartphone that's expected to go easy on our wallets: The OnePlus Two. The Two is expected to make its debut very soon, and it's said to feature similar specs as the Axon, from the same Snapdragon 810 to the 4GB of RAM to what some rumors suggest is a 5.5-inch Quad HD screen. The kicker: OnePlus CEO Pete Lau already confirmed that it'll cost less than the $450 the Axon sells for. Resist the temptation to be an alarmist: The OnePlus Two just might stop Axon sales cold, but we'll see how quickly the Oppo spinoff can churn those things out. I've got to hand it to ZTE: The Axon is the sort of powerful, budget-friendly phone I never thought the company would, or could, make. It's got gobs of power. It's mostly well-built. The camera isn't half-bad. And that tantalizing $450 price tag currently represents the floor -- the least amount of money you could spend on a phone as well-specced as this. So why won't I buy one? First, the software isn't as polished as it should be. Secondly, I need memory. I need room for files and photos and tracks and videos, and the widespread availability of cloud storage just doesn't cut it for me. The fact that ZTE made an actual contender of a phone, stuck it with only 32GB of storage and left out any expandable memory options is ridiculous. Samsung offers the Galaxy S6 line with more storage (for a pretty penny, but still). 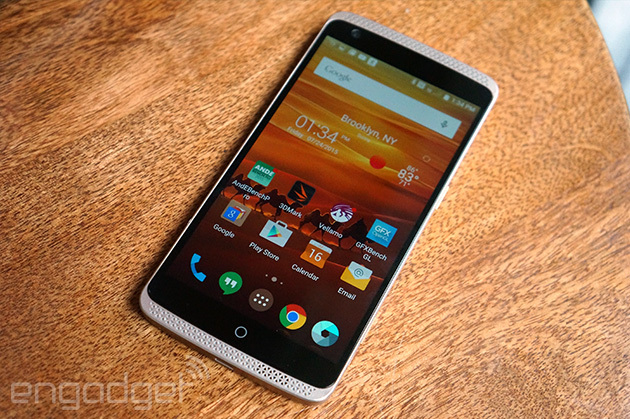 The Axon, then, isn't a perfect handset. 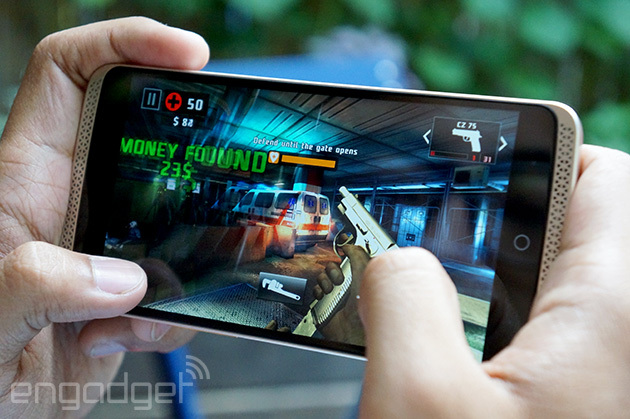 It is, however, a mostly great smartphone that makes me strangely excited for a sequel.